Product prices and availability are accurate as of 2019-04-25 16:24:53 UTC and are subject to change. Any price and availability information displayed on http://www.amazon.com/ at the time of purchase will apply to the purchase of this product. 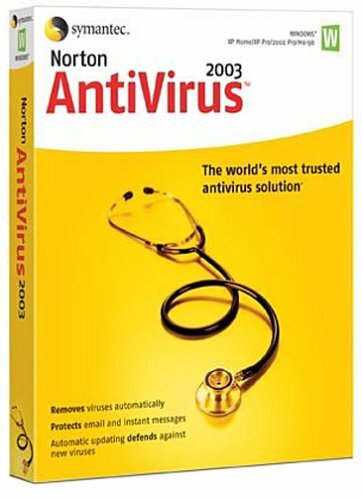 Symantec's Norton AntiVirus 2003 scans and cleans both incoming and outgoing e-mail, stopping viruses from infecting your computer or spreading to other computers. It removes viruses automatically, without interrupting your work. 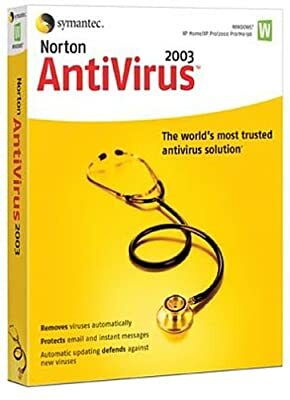 To prevent infections during real-time online chats, Norton AntiVirus now also detects viruses in instant-message attachments, including ones you receive using MSN, Windows, AOL, and Yahoo! messaging services. Updates are downloaded automatically over the Internet to protect your computer with the latest virus definitions from the Symantec Security Response team. These virus experts work 24 hours a day, developing new definitions whenever a new threat is discovered. Even between virus definition updates, Symantec's exclusive Worm Blocking and Script Blocking technologies can identify and stop suspicious programs. Because Norton AntiVirus is so simple to set up and use, you can be up and running with powerful virus protection right away. You also get step-by-step instructions for installing the program on a computer that's already infected. For small businesses, 5- and 10-user packs are also available.